The first all-new Warrior boat in three years combines that renowned rough water comfort built into all Warrior boats in an affordable 225-horsepower-compatible package with a boatload of other features and options included that anglers and families want. 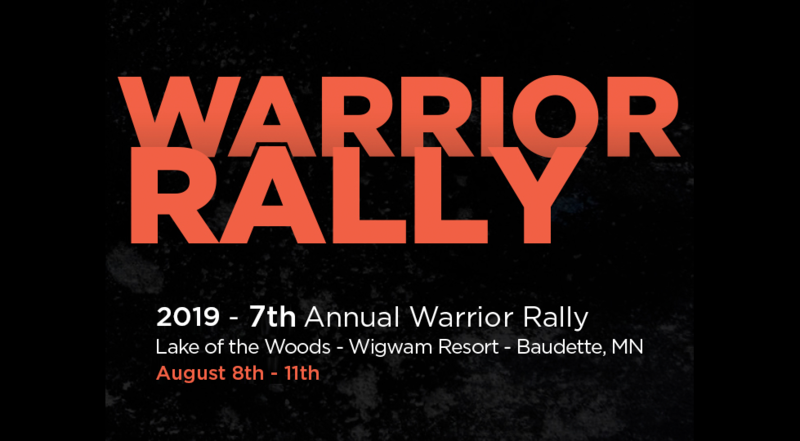 The new model, eighth in Warrior’s lineup, will be introduced at the March 21-24, 2019 Progressive Northwest Sports Show in Minneapolis. Larry Smith Outdoors TV will also feature the new model in the near future. “The new Warrior V198DC satisfies needs voiced by thousands of fans looking for an affordable package that’s just a rod tip shorter than our V208DC, but with the best-in-class features that’s made Warrior legendary among anglers and boating families across the Midwest and Canada,” said Kent Andersen, national sales manager. “We call it our Little Brother to the V208DC, which has been our best-selling model since its introduction in 2016,” Andersen said. “With those requirements, our design staff went to work. We stretched our V193DC, increased the beam to 100 inches and raised and widened the front deck. The V198 has the largest cockpit in its class and is priced in line with any other boat in its class,” added Chuck Barth, president and co-owner of Warrior, based in Melrose, MN. The V198 not only is an ultimate fishing machine. It also doubles as a great family fun platform to make memories for years to come. Rumors of the V198 were already causing a flurry of visits to Warrior’s Facebook site in recent weeks, Andersen said. The first hint that something new was on the way was a “watch this space” style teaser, which drew more than 13,000 views in only a few days. An early March video glimpse of the new hull drew more than 1,000 views in the first hour alone. Warrior’s full list of options also will be available for immediate order starting March 21 from any of Warrior’s 20 dealers, which stretch as far east as Ohio, as far west as Great Falls, Montana, and as north as Swift Current, Saskatchewan. 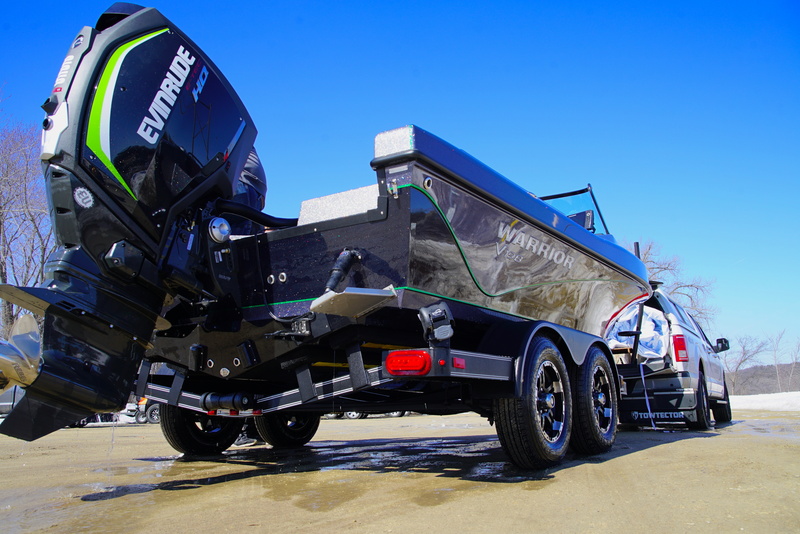 “They include everything from trim tabs to any depth finder or trolling motor you want, along with trailer options such as 18-inch tires,” Andersen said. A swing-away trailer tongue is standard, making it easy to fit in most garages. It will come from the factory packaged with a 225-hp engine of your choice. To say the V198 is made for fishing is an understatement. You want fishing room? You’ve got fishing room, with a length of 19 feet, 8 inches and a beam of more than eight feet. This Warrior weighs in at 2,300 sturdy, stable wave-defeating pounds, making it the perfect fishing platform that loves to play rough, whether you’re on the reservoirs of the Dakotas, the lakes of Minnesota or Wisconsin, or on the Great Lakes. With a fuel capacity of 48 gallons, it’s perfect for long runs to those secluded fishing spots. Fire up your motor (ready to match with Mercury, Evinrude, Yamaha or Suzuki) with the standard Group 31 AGM starting battery and pump out your fave fishing tunes from four speakers connected to your JBL radio with Bluetooth. Also standard is a top-of-the-line I-Pilot 72-inch, 112-pound thrust Minn Kota Terrova trolling motor with quick-release and RAM stabilizer, a Minn Kota 440PC battery charger, custom boat cover, keel guard, cup holders, snap-in, snap-out carpet for easy cleaning, and other extras you won’t find in the competition. Keep your catch in dual 33-gallon stern and 16-gallon bow aerated livewells, with dashboard controls and timers. Load up your 16-gallon bow cooler, and you’re ready for a day on the water. You want rod storage? You’ve got rod storage. Two side lockers, plus a center rod locker means you can carry a minimum of 28 rigged out rods up to 12 feet long. Stash your lures in the tackle storage under the stern jump seats, or in one of the many locking storage compartments aboard. Experience the entire lineup of Warrior Boats, from our classic V1890 Backtroller, to the ultimate Big Water Beast, the V21-21DC, at any Warrior dealer, online at our Facebook page, or our website.